“Snake!” someone suddenly cries. There’s a momentary paralysis among all who are nearby, now alert to a perceived danger. In the next few seconds, an escape reaction takes over that may lead to a directionless panic to get away. It’s as though our autonomic nervous system is genetically programmed for a flight response to snakes. Needless to say, snakes are among the least popular of animals, rivaled only by spiders in the “creepy-crawly” category. Far more people die of bee stings each year than of snake bites. In our senseless fear of these mostly benign animals, we often forget that everything in nature has a legitimate ecological role to play in support of our earthly home; even snakes and spiders. What curious and unusual reptiles, snakes. Covered in a supple skin of living scales; without legs or external ears and having ceaselessly staring, lidless eyes and a sinister flickering, forked tongue. Stepping back to consider snakes this way, it’s hard to imagine any living things more fascinating to be found on alien worlds in outer space! I must admit to being a lifelong snake admirer and I find them endlessly fascinating. Without snakes and their ilk to assist in creating balance in the web of life, we would be overrun with insects, rodents, and other creatures whose populations are kept in check by them. They are effective predators that use their highly developed senses of sight, taste (a modified type of olfaction), hearing (they have ear openings), and touch to locate, recognize, and track their prey. We are of no interest to them except as a threat, and it is in a defensive mode that they may bite if they feel there is no escape. Most people injured by snakes are often attempting to capture or kill them. Chelan County is home to an interesting and beautiful diversity of snakes. It should be noted first off that any snake you encounter will most likely move quickly away from you. If you impede their escape or try to capture them, some snakes in our area may try to bite. These bites are harmless but should be thoroughly cleaned and treated with an antibiotic. The exception here, of course, is the Northern Pacific Rattlesnake, a venomous creature that also prefers to escape and/or scare you with a buzz of its rattle, than bite. Many of you have probably seen the ubiquitous and harmless garter snake, a striped animal that occupies a huge range across North America and is common in our area. Below are descriptions and images of our snake fauna in Chelan County. Snake enthusiasts can almost always count on seeing Garter Snakes no matter what kind of snakes they may be looking for; there are lots of them! There are two species most commonly seen in our area: the Valley Garter Snake (Thamnophis sirtalis subsp. fitchi), and the Wondering Garter Snake (T. elegans subsp. vagrans). Both of these average 18-40” long, and can be recognized by 3 light stripes on a dark background. 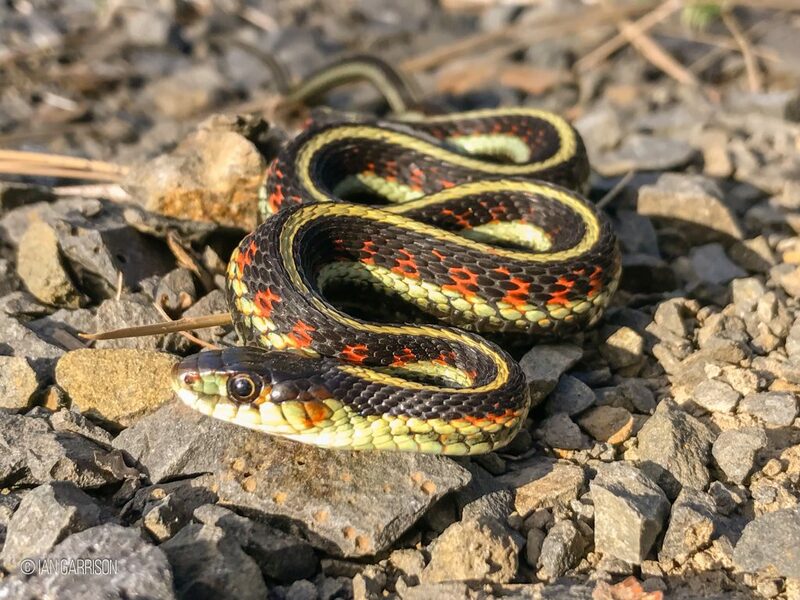 In particular, the Valley Garter Snake is black with a prominent yellow stripe in the center of its back and two yellow side stripes often bordered by red blotches. The Wondering Garter Snake is dark gray to brown with faint yellow stripes and small black blotches on its back. Both snakes are most often seen in well-vegetated areas near water (and irrigated gardens!) and, like all snakes in our area, will quickly slither away when approached. Garter snakes often try to strike and bite when captured, emitting a foul-smelling musk and feces. Nevertheless, they are harmless garden pest control partners. Gopher Snakes are nearly as common in our area as Garter Snakes. Also like the Garter Snake, Gopher Snakes have a large range in the West and the species is subdivided into several subspecies. The Great Basin Gopher Snake is a large and beautiful animal found in habitats throughout our area. It is our longest snake, ranging in size from 30-72” in length and has a light tan background color with large, dark brown blotches, or saddles looking at the large and small markings together, that give it a color pattern similar to the Northern Pacific Rattlesnake. They have also adopted several Rattlesnake-like behaviors to frighten their enemies through mimicry. When approached, it may coil, flattened its head, vibrate its tail, and strike out in imitation of a rattler. The color pattern and behavior of Gopher Snakes not only fool their enemies, but also many people, and many snakes are needlessly killed. They are beneficial hunters of rodents but may also cause problems for small, infant farm animals like chicks, ducklings, and rabbits. 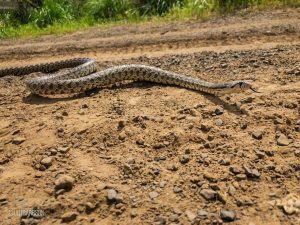 How to distinguish between mimicking Gopher Snakes and Rattlesnakes? Gopher Snakes have a more slender, elongated body without a noticeable rattle on the tail. Rattlesnake dorsal blotches coalesce into rings on their tails leading to their rattles. Gopher Snakes have round pupils while Rattlesnakes have vertical ones (cat eye). Gopher Snakes do not have swollen venom glands behind their eyes at the back of their heads like Rattlesnakes, but they can flatten their heads to mimic the look of a Rattlesnake. The common name of this long, slender snake makes clear some of its attributes: their bellies are usually yellow and they’re fast! Like so many of our native snakes, including those discussed above, Racers have a very large range across the U.S. and there are several named subspecies. These slender snakes are 20-40” long with large, smooth dorsal scales ranging in color from tan, olive, to grayish brown often with a blue or greenish cast. 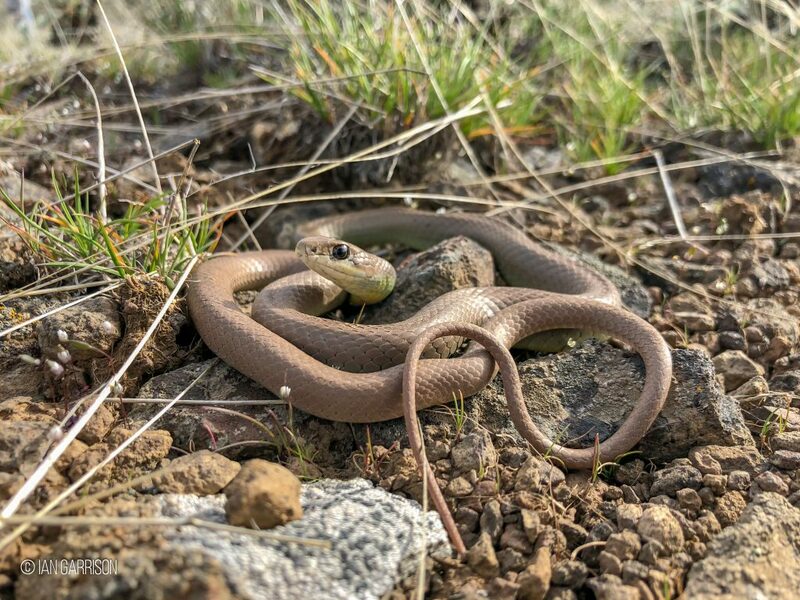 Grayish brown snakes in our area may be hard to see among the sagebrush, where they sometimes perch! They also have relatively large eyes with round pupils. The juveniles are exceptionally beautiful with rusty brown patches on a cream-colored background. Racers prefer sunny habitats and are mostly found in pine woods, oak savannas, and sagelands. They are more often heard slipping quickly through the grass than seen. People are often surprised to learn that there is a Boa (yes, a relation of the South American Boa constrictor!) 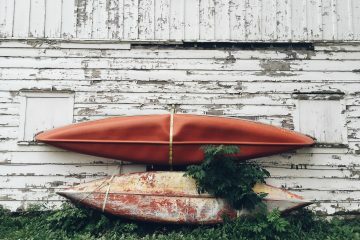 native to Washington. In fact, compared to the snakes already described, the Rubber Boa’s range is concentrated in the Northwest. 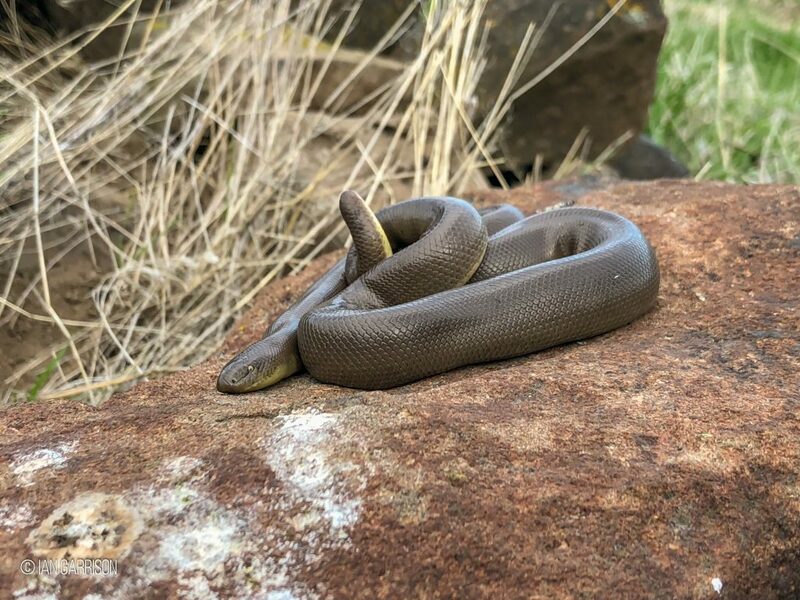 Also unlike most of our other native snakes, this docile, silky smooth animal is quite calm by nature and never bites. However, they may expel a foul smelling musk when handled. These are stout-bodied snakes with little taper averaging 17-27” long and uniformly tan to chocolate or olive-brown in color. 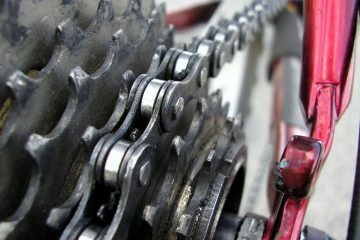 When still, they may look artificial with their very small scaled, exceptionally smooth, rubber or plastic-like skin. They have a muscular, rubbery feel and appear two-headed with their blunt, rounded tail. Look closely, they have small, lustrous yellow cat eyes with jet black, vertical pupils. Rubber Boas are rather secretive animals that inhabit a broad range of habitats in our area, most often hiding under logs, rocks, and discarded construction debris—they lead a rather subterranean life. 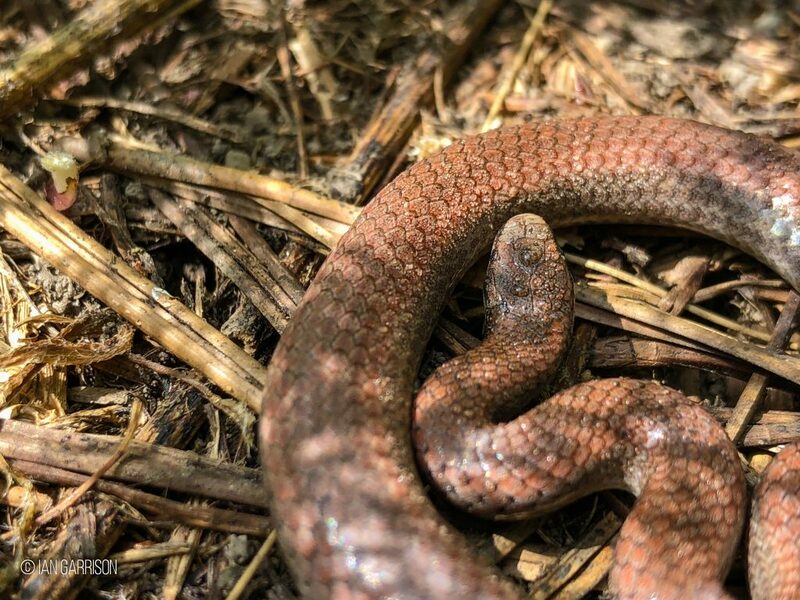 I’m certain that many people who uncover a Sharp-tailed Snake may mistake it for a worm! Or, given their smooth texture and the color of their skin, they might at first be mistaken for a newborn Rubber Boa. In any case, Sharp-tailed Snakes are the smallest of our native serpents—adults average only 8-12” long— and are as secretive as Rubber Boas, preferring to hide under and within rotting logs, underneath rocks, and in debris piles. Their monochromatic color of dull reddish brown to brownish gray with a hint of two coppery stripes on their sides may blend well with the soil or stony ground where they lay. Their undersides, however, are finely striped in black and white lines. The common name is derived from the acutely pointed tail tipped with a small spine, an attribute thought to be useful in pinning down their favorite food, slugs. These rarely seen, small denizens of the sagebrush are, as their common name implies, nocturnal. Adult snakes only average 12-18” in length and are wonderfully patterned to blend into their desert surroundings. Night Snakes are mottled in shades of brown and tan with large, squarish dark brown blotches along their back against a background of light brown or tan, like a very small Rattlesnake or Gopher Snake. They have a dark brown collar at the neck that also forms a mask across their golden cat eyes with vertical pupils. Although they have no rattle, Night Snake coloration and head shape do resemble our Pacific Rattlesnake. They are also equipped with small, rear fangs that inject a weak venom into their lizard prey. They are harmless to people and can be rather docile. 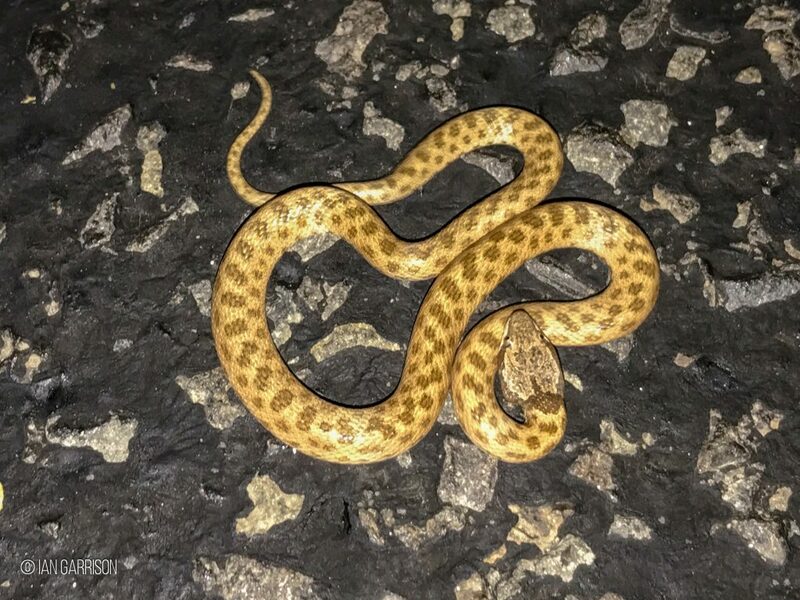 Night Snakes are most often seen on roadways at night absorbing the collected heat of the day. Snake fanciers in the Northwest may crown the Northern Pacific Rattlesnake as the king of the realm—not for its fearsome venom, but as the largest and, perhaps, most beautiful of our native snakes. Still, because of their venomous bites, rattlesnakes should be appreciated from afar! And that suits them just fine, for they are as frightened of us as we are of them! These stout animals may be 15-36” long or longer, thick-bodied, and are the only snakes of concern in our area. The distinctive rattle at the end of their tale is the key to their positive identification; they all have one and will vibrate it into a loud buzz with little provocation when approached. They also have a proportionately broad head with beautiful bronze cat eyes (vertical pupils) and ahead of those, two orifices, or pits (“pit viper”), that look like nostrils. They are coarsely scaled snakes, their overall dorsal color is light brown, grayish or olive brown with large, dark brown blotches along their spine and smaller ones on the sides. This color and pattern often morphs toward the tail into dull black and white rings terminating in a set of chambered, tan-colored rattles. 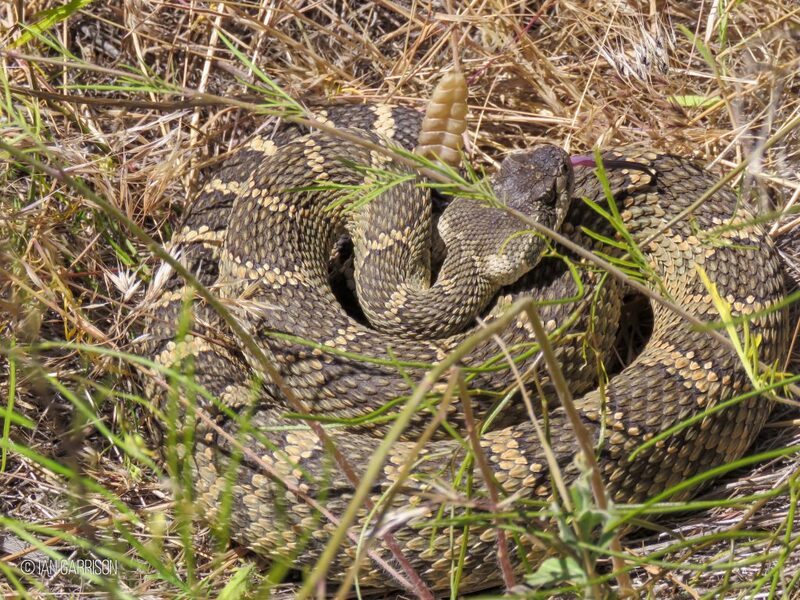 Northern Pacific Rattlesnakes may be seen in desert sage lands, grasslands, and pine forests. During the hottest weather, they are most active during the morning and evening in search of rodents, their principal food. Rattlesnakes do not seek out or pursue people. In fact, they will most often retreat when approached, or, if trapped, will coil and buzz their rattle. The best antidote to fear is knowledge and familiarity. To paraphrase the naturalist Henry Beston, at this point in our modern lives, we need a wiser and a return to a more mystical concept of animals, including snakes. They move finished and complete in a world older than ours, gifted with the extension of senses we have lost or never attained, living by voices we shall never hear; they are whole other nations caught in the splendor and travail of Earth.